COLIN KERRIGAN TTN Tandoor India Restaurant serves up cultural dishes, either buffet-style or a la carte, perfect for the penny-pincher. Traditions are a way of life in India, and tucked off Chestnut Street lies a hole-in-the-wall Indian restaurant that stays true to its homeland’s culinary customs. Located in the heart of University City, Tandoor Indian Restaurant offers an array of vegetarian and non-vegetarian dishes, most famously its tandoori chicken, which juxtaposes succulent spices with touches of mint and lemon. The restaurant gives diners the option of buffet or a la carte, with the lunch buffet for $6 per guest and the dinner for $11. 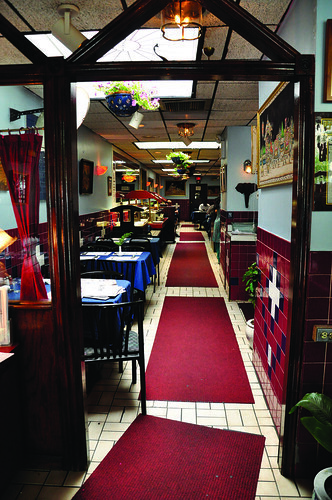 While the menu is vast, the buffet only offers seven to 10 dishes, depending on the time of day and customer turnover. Though menu options may be limited, the “core” dishes are always offered: tandoori chicken, samosas or pakoras, basmati rice and a vegetarian dish. Niazi, a junior at the University of Rochester, said he is familiar with Indian food and added that Philadelphia offered much better fare than this, but with a higher price tag attached. Decorated richly with traditional Indian art and with a sitar soundtrack playing quietly in the background, the sweet-smelling restaurant transports customers to the exotic land of India. The service, however, was lacking. The waiters rushed customers through courses by clearing plates early and hovered over tables, too eager to please. A thin wallet doesn’t have to mean an empty belly, and such is not the case at Tandoor. For an inexpensive night out and a sampling of traditional sub continental fare, Tandoor is the place to go. Sharing the community surrounding Main Campus could lead to a gap made of more than geographic borders. Alyan’s delivers the flavors of Middle Eastern culture and food on a dime. Kilimandjaro serves fare from West Africa, specializing in classic dishes from Senegal.